So that you have something to send to the board house. 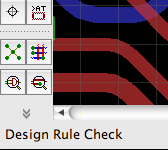 Locate and run Design Rule Check. 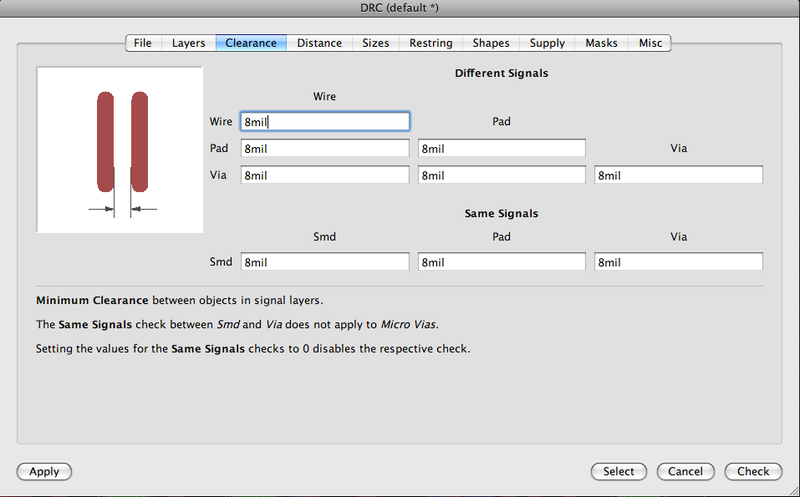 A dialog with a lot of design constraint parameters will open. You need to check with your board house to know the exact values they allow. You should then enter them here and never deviate. The most important parameters: trace clearance, pad clearance and via clearance. Typical values for a low-end board house would be 8mil or 0.2mm. This is how far the edge of the PCB is from the copper. Don't put traces closer to the edge than this value. Normally about 0.5mm. 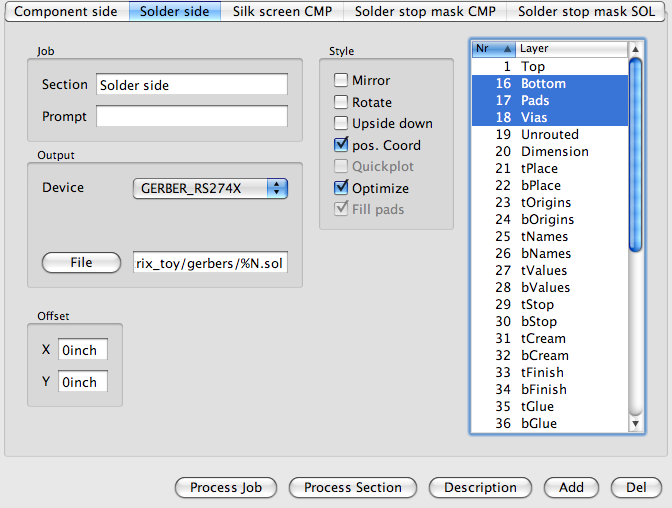 Stop: how far away from the edge of a SMD/pad the mask will be. If you're reading this you don't need Cream. Limit is an interesting parameter. 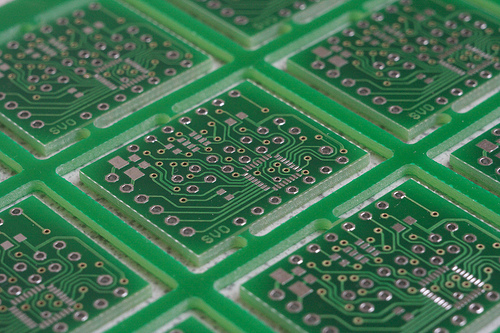 It allows to specify the size of pads/vias that do not need to be automatically unmasked. Anything smaller than Limit will be covered with solder mask. Useful for vias. If you need some vias open, it can be done individually in the properties dialog, or by drawing polygons in tStop/bStop layers. 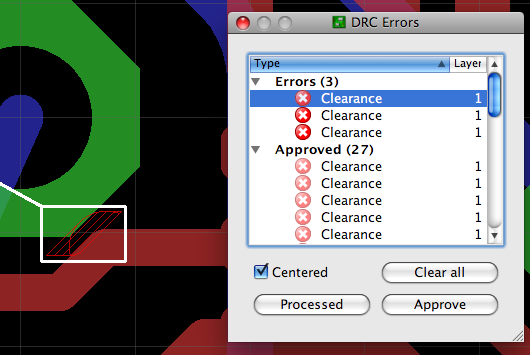 Some DRC errors can't be avoided because of package specifics. 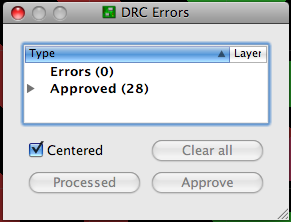 If it is certain that this particular DRC error can be allowed, Approve it. It will be added to the list of approved errors and will not bother you again. Other problems should be corrected. When you get a picture like this, this is good. 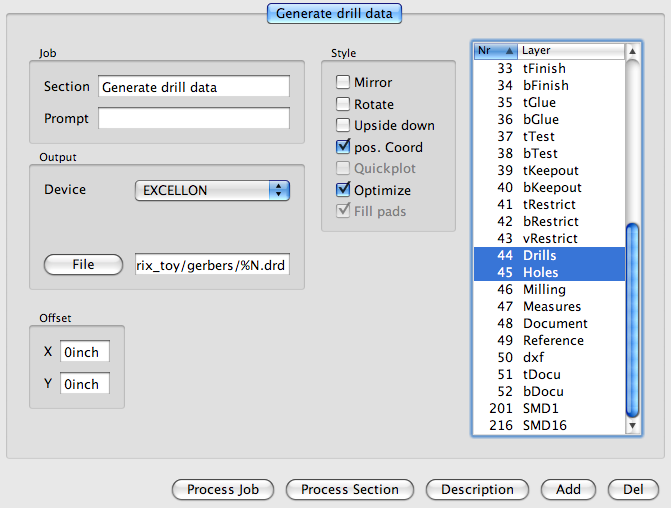 Time to make the drill and plotting files. 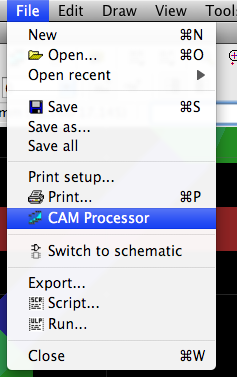 CAM Processor processes CAM files. CAM processor transforms the contents of one or several layers into various file formats. To make several files, a Job with several tasks can be created. Fortunately, the most typical Jobs are already defined and packaged with EAGLE. They can be found in cam/ folder wherever your EAGLE is installed. It's probably a good idea to make sure that output paths for the job are convenient. By default they will generate files in the project folder and project folder probably already contains a lot of files. Run: Process Job! and there are .dri and .drd files on your disk now. This job is comprised of several sections. The title of each section is listed in the tabs at the top of the dialog. 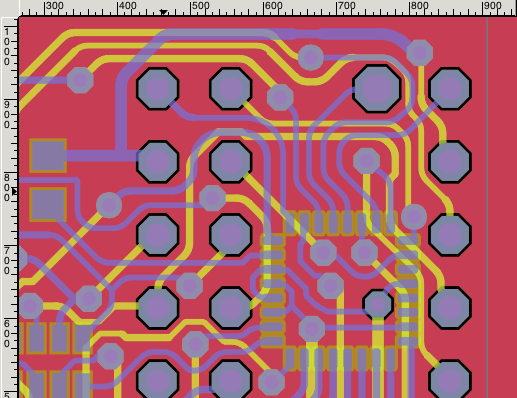 Verbatim: component side (red, Top), solder side (blue, Bottom), Silkscreen (top), Solder Mask (top), Solder Mask (bottom). Everything is prepared already, although you might want to uncheck "Mirror" for the bottom layers, depending.